Enroll Your Child in a Pottery Class! We live in a rapidly changing world, with ever-evolving standards for our children’s education and life skills. Every day there seems to be a new study on the do’s and don’ts of child rearing, and in this day and age, it is hard to know which sources are reliable. Schools are increasing lesson plans and workloads for children, yet sometimes it seems to be more of a detriment, increasing anxiety levels for kids and a very young age. Kids need an outlet that will not only provide a break from the stress of everyday life, but that will also give them a creative and stimulating outlet – something that will require focus, while bursting through the rules and parameters of their highly structured lives. 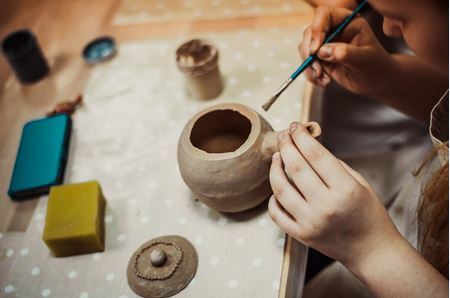 At Dragon Fire Ceramics, we provide pottery classes for children that provide just that – a freeform outlet that allows children to explore their creativity and express their energies in a constructive and imaginative manner. The possibilities are endless when kids have a lump of malleable clay to control at their whim. Focus is required to sculpt pottery, but it is not the same type of focus that is necessary when it comes to learning about the periodic table of elements or Paul Revere’s midnight ride. Both of those academic examples are surrounded by right and wrong answers. When your child is sculpting a lump of clay, their focus is meditative and there are no right or wrong answers, only infinite possibilities and endless answers. In fact, that’s one of the most beautiful things about Dragon Fire Ceramics’ pottery classes – there is no judgement. Whether your child wants to create a stylized bowl or a skateboarding dinosaur, we encourage them to make whatever comes to their imagination in a welcoming and freeform environment. Molding clay also helps your child with sensory development. When kids manipulate, pound, squeeze and roll clay, they are able to stimulate their senses, while blowing off steam in a constructive way. Not only does this provide them with a catharsis, it also improves hand-eye coordination, balance and agility. Our kids are constantly surrounded by screens. What we do is give them something tangible for immediate mental and sensory stimulation. The tactile nature of ceramics allows your child to be in tune with the real world in the midst of the digital age. Sign your child up for a class at Dragon Fire Ceramics today! Take a look at our upcoming schedule online, and call us today at 218-384-9374 to register.